Fried Friday: Invisible Faculty? Not This Math Instructor! This week we’ve been talking about creating your online persona. Sometimes students complain that they don’t feel their professor is active or visible in the course. We hope that you never hear complaints about your course or your sense of presence in your classroom. 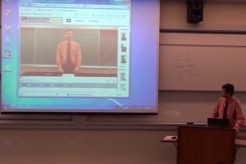 We thought you might enjoy the clever way this math instructor introduces his topic of “Imaginary Numbers” to his classroom. After watching this video, I think you’d agree that this instructor made an impression on his students. We hope you enjoy this funny video and we look forward to seeing your submissions to the Creating Your Online Persona Challenge. Click image to view the video. While you may not create something this elaborate, there are so many ways that you might invest a little time for that huge pay-off, having your students really connect with you even if they never meet you face-to-face.You might enjoy looking at some of the examples posted in a PPT presentation created by Bill Phillips, University of Omaha. He provides many excellent ideas and a variety of examples. The Online Teaching Persona. And don’t forget to send in your submission for the FLC Faculty Challenge on Creating Your Sense of Presence. You can scroll down for the post describing the challenge. If you need any help, please don’t hesitate to call Kathi/Maureen/Nicole or Tina. We’ll be voting next week, so get your submissions in soon! You can click the banner to view submissions as they are submitted. © 2019 Faculty Learning Corner.